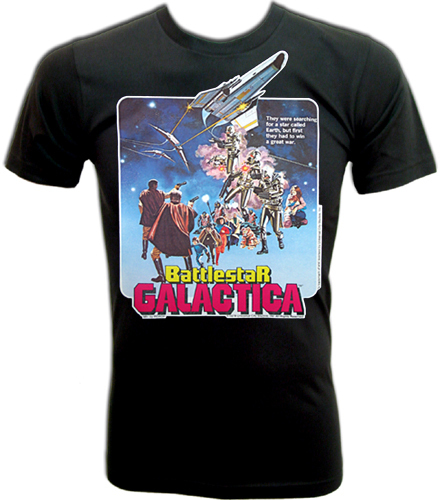 An authentic Universal City Studios, Battlestar Galactica Movie/ TV show shirt featuring a vintage 1978 iron-on heat transfer print on a new and unused shirt. You've seen the cheap "retro" shirts and the new TV series but now here is your chance to get a piece of true Sci-Fi history. 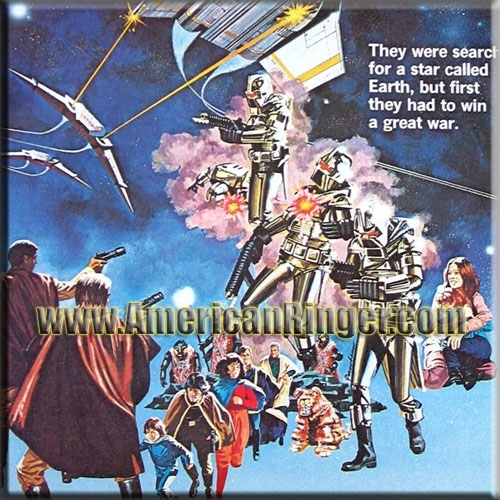 This very scarce original 1978 Battlestar Galactica teaser poster print for the movie glorifies Richard Hatch, Dirk Benedict, and Lorne Green as it did on the original advance movie poster. "They were searching for a star called Earth, but first they had to win a great war!" This vintage Universal licensed heat transfer iron-on tee won't last long, so get yours before they are all gone. AmericanRinger.com acquired these rare vintage shirts and NOBODY ELSE HAS THEM! This is the real deal vintage stuff and once they are gone they will be gone forever.